Culture & history: A 14th century citadel rises over the entire town of Alanya, with its famous red tower (named Kizikule in Turkish) dominating the skyline. Inside the citadel, you’ll uncover hidden jewels like little Byzantine churches and mosques with intricate geometric patterns. The Kizikule is just one of many iconic monuments you can visit while enjoying summer holidays to Alanya. 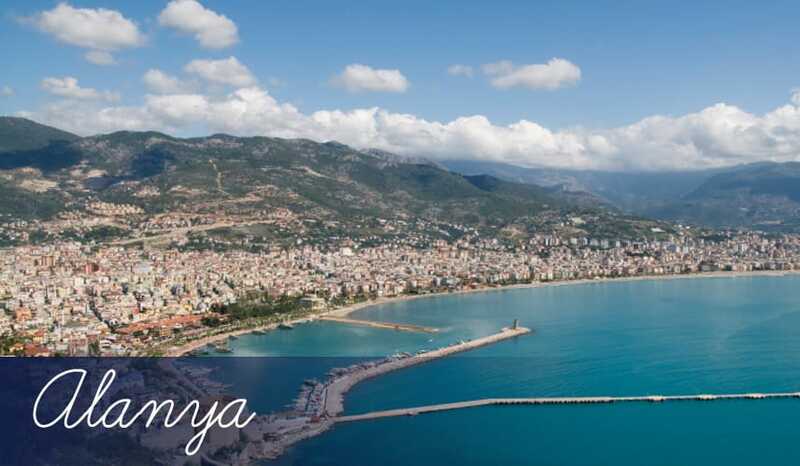 Beach holidays: There are two lovely beaches in Alanya. Both have soft golden sand and ample space for when things get busy during the summer holidays. Big on nightlife: The ‘Harbour Mile’ is a long stretch along the waterfront lined with buzzing bars and clubs that stay lively until 4am. You’ll be spoilt for choice if you like party-mad holidays! Alanya Kalesi: The Castle of Alanya is a UNESCO world heritage site and the locals are so proud of it they’ve made its Red Tower the symbol of Alanya. Overlooking the sea’s edge, it’s in a stunning location, and the still fully-intact brickwork gives you a great idea of 14th century medieval architecture. Damlatas Cave: There’s an array of underground, and indeed underwater caves in Alanya. Damlatas is the most famous of the lot, perhaps because it’s easily accessible by foot, but also because of the molten-looking stalagmites and stalactites. It’s often referred to as ‘The Cave of Dripping Stones’ and is an essential sight on holidays to Alanya. Diving holidays: The calm crystal clear waters of Alanya make it the perfect place for diving. On holidays spent under the sea you’ll come across many different types of marine life, including exotic fish and conger eels. You may even catch a glimpse of a sea lion! Eastern Beach: Basically one beach split in two, the eastern strip of sand is known simply as ‘Eastern Beach’. They’re both similar in that they have wide expanses of golden sand, but the waters here are slightly calmer and more shallow. That means this one’s slightly better if you’ve got the kids in tow on family holidays whether you’re on an all inclusive holiday or a self catering deal. Cleopatra Beach: On the western side of the holiday resort, Cleopatra Beach again has a large space of golden sand, but the waters here are slightly rougher than on the east. This side of the beach is also a bit busier as most of the larger hotels are found over here. The majority of hotels and resorts offer all inclusive holidays, half board deals and other holiday packages. The Blarney Stone: Unusually for a Turkish holiday resort, this Irish restaurant is as authentic as any you’ll find in Ireland itself. The Irish Breakfast here is fantastic, and they also serve traditional Turkish food to vary things up a bit, maybe one to visit if you want to feel a little closer to home for a short while, like taking a break to relax for your holiday. Panderosa: A friendly welcome awaits you at this lively restaurant and bar. Serving classic Turkish dishes alongside British home comforts, you’ll find something here to suit every palette. At night, the atmosphere heats up as the restaurant turns into a fully-fledged bar where the staff dance just as much as the guests! Yenihal Market: Held every Friday in the north of Alanya, this expansive market features hand-crafted clothes and ornaments, as well as fresh fruit and vegetables. You’re actually encouraged to barter with the market traders, so you’re bound to get some great bargains that match well with the cheap holidays to Alanya available on Sunmaster.